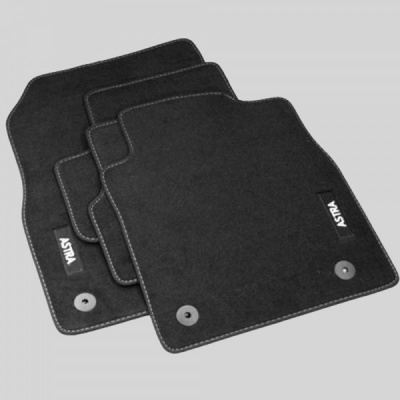 Genuine Vauxhall Astra J velour mats tailored to fit your Vauxhall Astra J. These popular, genuine Vauxhall black Astra J mats have the Astra logo embroidered in white on the front mats. Fixing eyelets on the front mats fit over the fixing points in your vehicle to hold these mats in place. We aim to dispatch all Standard Delivery orders within 1 working day of receipt if the item is in stock. Occasionally we may need to order directly from the manufacturer and we will notify you and dispatch your order within 2 - 3 working days. All orders placed before 12 noon on a Next Working Day Delivery will be dispatched the same day or the next working day if the order is placed on a weekend or a Bank Holiday. Next Working Day Delivery orders dispatched on a Friday will be delivered on a Monday. All returned items must be returned to us within 30 days of receipt, unused and in a re saleable condition with all labels and packaging intact. Please email us at enquiries@underwoodscarparts.co.uk and we will provide you with a returns authorisation number and our returns address. We advise that you obtain a proof of posting at the Post Office or send your return through a trackable postal option. Please let us know when you have sent your returned item. Please be aware, we cannot refund postal charges incurred when returning the item. If you have requested a refund, this will be issued when we have received your returned product. If you require an exchange, this will be sent when we have received your returned item. We accept most major credit and debit cards as well as payments by PayPal. You do not need a PayPal account to shop with us. 100% secure.